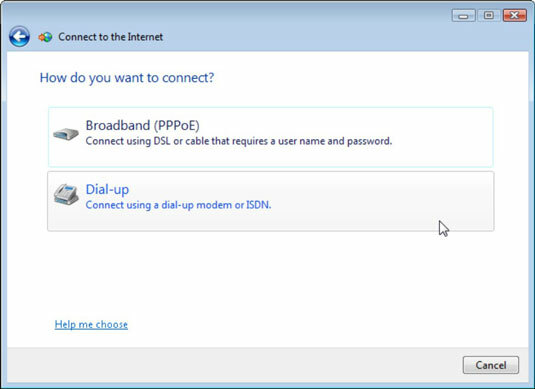 If your computer has broadband (DSL or cable) access to the Internet, it can save you some time and trouble to have an always-on connection. 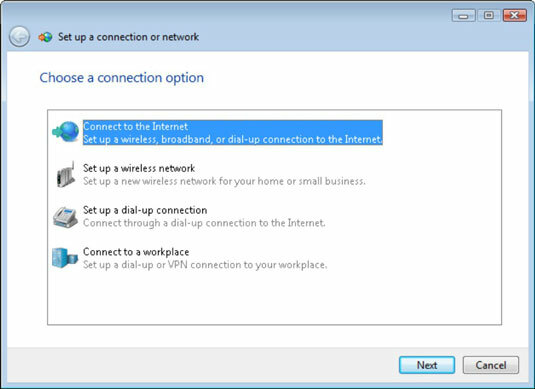 Vista assumes that you’ll always want easy access to the Internet, so setting up a wired broadband connection automatically creates that always-on connection. You might not need to perform these steps though. 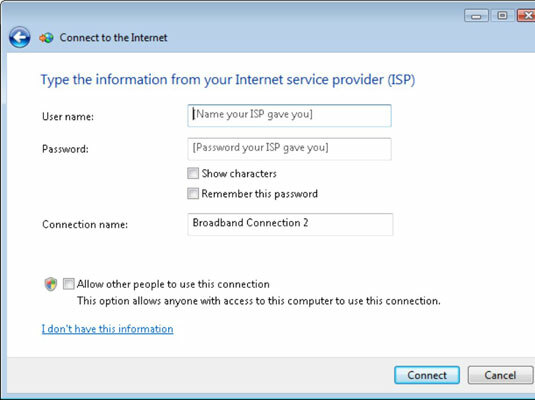 If your Internet provider doesn’t require a username and password, simply connect your broadband or cable modem and then restart your computer. 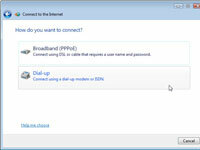 Windows Vista should automatically detect the connection. 1Choose Start→Network and click the Network and Sharing Center link. 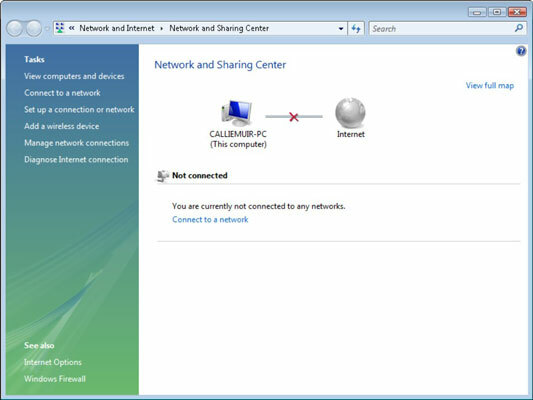 The Network and Sharing Center provides links for a wide range of network features. 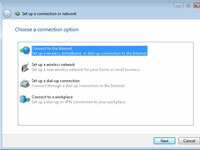 2Click Set Up a Connection or Network. 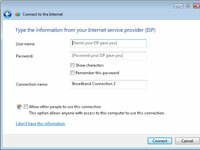 If you have any existing connections at this point, you might be asked whether you want to choose an existing connection or set up a new one. If this happens, click Next to set up a new one. 3Make sure Connect to the Internet is highlighted and click Next. A broadband connection is one that is physically connected to an Ethernet line, which is physically connected to a modem or router. 5Enter your username and password information and a connection name, if you wish, and then click Connect. You might also determine whether you want the characters that make up the password visible to whoever is looking at the screen. Disabling this option isn’t a great idea for security purposes, but if you tend to forget your passwords, it comes in handy. You can also choose to have the computer remember your password for you so that you don’t have to enter it each time. 6Click Finish when the wizard finishes scanning your connection. You’ll have to wait for a couple of minutes while Windows Vista scans and tests out the connection. Click the Finish button when the Wizard is done working its magic.